The Scottish capital of Edinburgh is quite unlike everywhere else in the UK. Boasting oodles of charm and a sense of pure class you're unlikely to find anywhere else on the British Isles, this is a city that likes to show off. 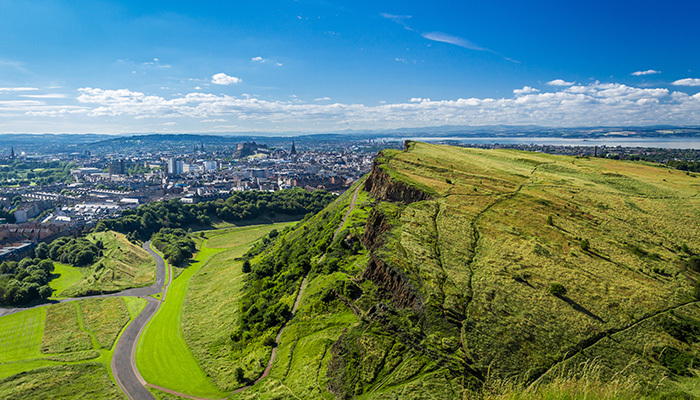 Edinburgh is situated in the beautiful region of Lothian atop a hill, from which you can see the wild countryside that forms much of the surroundings. This natural beauty is only eclipsed by the stunning architecture - the city has done well to preserve much of the original gothic stylings that dominate the centre and the old town. One thing is certain - there are plenty of places where you'll want to get photographs. Here are our top ten. The world's most famous boy wizard Harry Potter was born in The Elephant House. Not literally, of course, but this is where adored writer JK Rowling would sit with her young girl in the pram and write for an hour or two every day about the scrawny sorcerer and his friends. As soon as you take a step inside, you'll understand exactly why she chose this cafe. It oozes warmth and cosiness, and if you sit at the window at the back, you have stunning views over the rest of the city as the valley opens up. Indeed, even the front is eye-catching, with its distinctive red front and pile of pastries in the window. Get your photo here before heading inside for a coffee. About a mile to the east of Edinburgh Castle, a group of hills that form Holyrood Park roll up out of the ground. The main peak of these is named Arthur's Seat, once described by Robert Louis Stevenson as "a hill for magnitude, a mountain in virtue of its bold design". And once you get to the top, you'll understand exactly why. Spectacular sweeping views surround you, with the city to one side and the untamable landscapes of Lothian to the other. As for the name, the hill has often been touted as a possible location for Camelot, where King Arthur and the Knights of the Round Table held court over wine and tales of fantastic adventure. Get your photo - where else? - at the top. The famed crown spire of St Giles' Cathedral has adorned many a postcard featuring the famous skyline of Edinburgh. Now, the beautiful building with its traditional gothic architecture and spectacular stained-glass windows can be the subject of one of your photographs. Situated on the stunning Royal Mile - which contains dozens of beautiful old buildings - it's a regular on the ghost tour hotspots. Grab a photo by the Chapel of the Order of the Thistle, which were Scotland's chivalric company of knights headed by the Queen. However, you'll need to obtain a permit for photography, available at the Information Desk at a cost of £2. 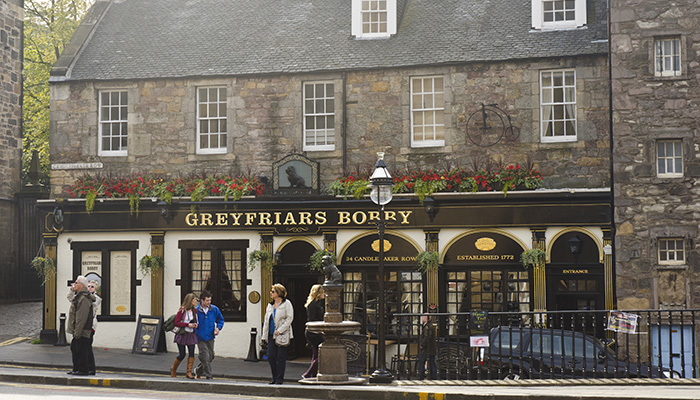 Located on the corner of Edinburgh's Candlemaker Row, you'll find a statue of a Skye Terrier looking mournfully at the passing tourists taking photos. This is Greyfriars Bobby, a local legend and monomyth who supposedly spent 14 years guarding the grave of his deceased owner before passing away himself. The little mutt has become such a celebrity that you'll often find there is a queue to take photos, but getting one is part of the quintessential Edinburgh experience. He takes his name from the Greyfriars Kirkland - just around the corner from the statue - where his master lies in his grave. Pay a visit here and get a photo too. You need to look for the one that says 'John Gray'. 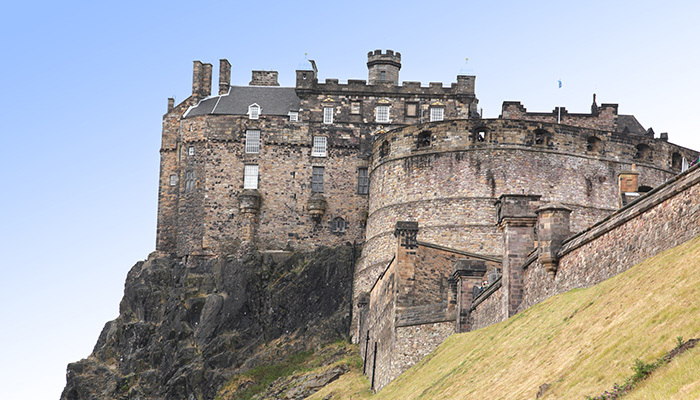 Perhaps one of the most prominent aspects is the stunning Edinburgh Castle, a historic fortress that looms dramatically over the rest of the city from its position on Castle Rock. Archaeologists have traced human settlements here all the way back to the Iron Age. Its rounded stone towers are thought to have been the original inspiration for Hogwarts School of Witchcraft and Wizardry, as JK Rowling used to stare longingly at them out of the back window of The Elephant House cafe as she was writing. But the fortress is particularly known for the One O'clock Gun, which fires at this time every day and has become known as a symbol of Edinburgh. This is where you'll want to take your photo. Our final photo-spot is the UNESCO-protected Old Town, which is the oldest part of the city. Much of the medieval street plan has been preserved, and there are a number of reformation-era buildings where you'll want to pose. Wander the twisting alleyways for an hour or so and you'll come across numerous statues, fountains and monuments that are worth a photo. Places to watch out for include the Scottish Parliament Building, the Old College of the University of Edinburgh and the National Museum of Scotland. Now that you know the top spots to take photographs in Edinburgh, you can start the preparations for your trip there. Just one thing - be sure to remember your camera!